Special thanks to Jay Sprinkel for assistance with this post. Although he may be more known for the humor he provides to our Facebook group, Jay is a retired marine biologist who specializes in statistics. He is also a member of the Board of Directors of the new Rheumatoid Patient Foundation. ACR 20 is part of the vocabulary we learn when we read about RA, along with its siblings ACR 50 and ACR 70. But it’s a bit of a mystery and it may be due for a re-model. First, how do the ACR 20 criteria work? This method is used to describe the response of patients to Rheumatoid Arthritis treatments in Clinical Trials. ACR 20 is viewed as a threshold to show that a drug is better than a placebo or not treating at all. You probably guessed it by now, but ACR 50 signifies a 50 percent improvement and ACR 70, a 70 percent improvement. It’s crucial to realize that “improvement” is what’s measured because improvement is relative. A person with severe RA who improves 50 percent may be more functionally disabled than a person with mild RA who has only a 20 percent improvement, but what’s calculated is the success of the treatment. Why would something different from ACR 20 be wanted to describe RA treatment response? There are difficulties with the current method because the patients are not separated according to actual response level. ACR 20 describes all patients who improved to this level. ACR 50 includes describes everyone who improved to this higher threshold; however, it also includes those ACR 20 folks, since anyone who improved 50 percent would, in reality, have improved 20 percent. The people in the ACR 70 group are also counted in both of the other groups. 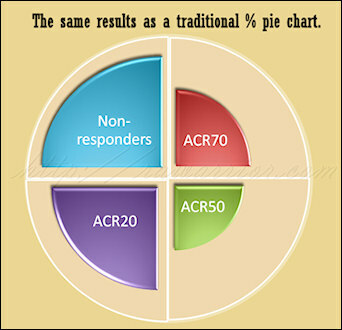 There is also no group called ACR-NR or Non-responders – those who did not obtain at least improvement of 20 percent. We are left to calculate that number, if it’s of interest to us. What would a new reporting method look like? Compare my two pictures; these are created as artistic notions of what a new model might look like and aren’t technically representative of any particular result. However, they show how we might be able to compare two models. The pie chart image represents a common way to think of simple percentage divisions: non-overlapping. 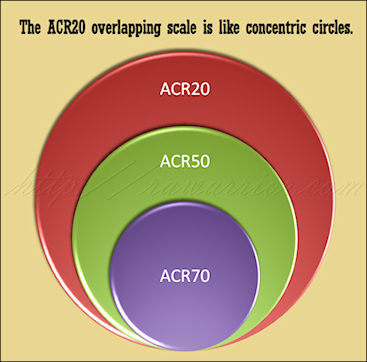 The concentric circles image illustrates the way ACR20 criteria works today, each level inclusive of patients from the previous level. Using the example of a Pfizer tofacitinib trial from a post last March, we can see how the results look different. Look at the bottom half of my chart where it says “New Non-overlapping Report.” The same numbers are used from the same study. These are the actual percentages of patients who obtained the particular results. 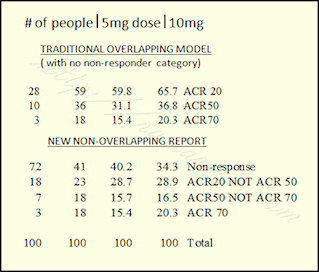 Using the right-hand column (those who got the 10 mg dose), 34% of people did not respond; 29% reached ACR20 and no higher; 16% reached ACR50, but no higher; and 20% reached ACR70. If 63% either have no response or no better than a 20% improvement in symptoms, are we over hyping these drugs as miracles? While a 20% improvement in symptoms is welcome in most cases, with no more than a 37% responding significantly are these medicines also being over prescribed? The prevailing opinion is if you start these treatments you will get your life back? While I have not responded to the anti-tnf agent biologics, I at first believed they would be the difference in controlling my RA. The other point that one does not want to overlook here is again the reliance on blood tests (sediment rate) and joint swelling to also determine whether or not these treatments are working. 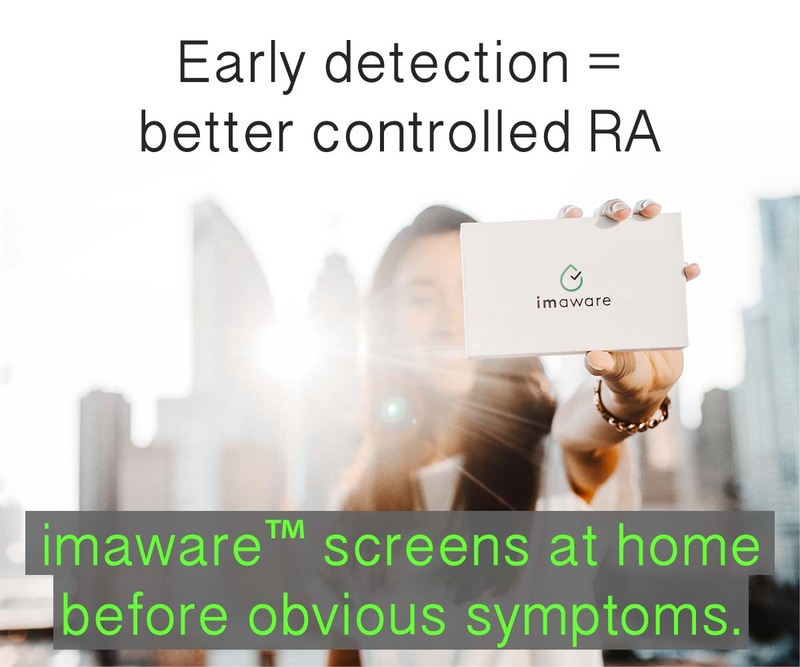 What about the RA patients whose sediment rate never confirms. What about those who have no outward signs of swelling? Is this now a case where one is told either the medicines are working or they must not have RA? What this post demonstrates is the need for a non-responders category. And more importantly better education on the true expectations of these treatments. Nice work on this everyone! I like knowing the percentage of non responders, since that is so common with RA. That way if I am one of them, I don’t take it personal, think I am such a loser I can’t even respond to some new wonder drug. Instead I know I am in good, but unlucky company. Yep, the pie chart is easier for me. Apparently some researchers out there are so optomistic about the new biologicals that some are now referring to an ACR90 response! I just chuckled when I saw that, although I do know there are a few who get that type of response, though not many achieve it for long periods of time. Problem is those who do aren’t usually posting to sites like this as they are out living their lives to the fullest! I’m thinking many docs are becoming more conservative about moving folks to such expensive biologicals given how many don’t respond or only respond for a short while to any of them, or experience the side effects to much. I think that’s the way my new rheumy is going to be, as she pretty much said so on the first visit. I’m not asking for the biologicals just yet though. Hi again Chelsea, I replied to you previously but I don’t know if I hit the correct reply button. There is one more thing I’d like to add; you said “I’m not asking for biologicals just yet though”. I am very glad for you that you don’t feel you want to risk these big gun drugs, I truly am. But for me, I remember sitting in a wheelchair begging my doctor to let me start them. This was the morning after a very long night of pain at a level I never knew existed, I commented about that night on Kelly’s blog ‘What is a Rheumatoid Arthritis Flare’ that she wrote in December of 09. #47. I know we need transparency in reporting of clinical trials, but I for one, am not ready to bite the hand that gave me my life back even if it’s just for a short time. Wonderful – thank you! I kind of got ‘it’ before, but now I fully understand. Thank you to all that wrote and helped. I agree with all of the above comments. I was devastated when I didn’t respond to Remicade (I was told it may work for me because the dosage could be upped). I too am a non-responder and would like the category to be a part of trials. Well, that certainly makes it much clearer! The pie chart seems to be a more honest and understandable representation of the results than the overlaping percentages. By including one group in the other the overall effectiveness is overstated – this is more marketing hype than truth. I had a great deal of trouble understanding the whole ACR 20, 50, 70 thing but it’s starting to make some sense and this certainly helped. Although, I don’t know about anybody else, but I know when today my joints feel better or worse than yesterday, but I have a great deal of difficulty putting a percentage on it. Do they hurt 20% less than they did before methotrexate or 50% less – and it varies so much day to day – so hard to put a number on it – yes, it’s better – but how much? I do know that if I were trying to make a choice about taking a biologic, it would be easier to evaluate the effectiveness of the drugs and the possibility that I might not respond with the pie chart info than with the overlaping data regardless of how they decided what makes 20% better. I guess you have to decide how much of a risk is worth that 20% – that being the “most likely” outcome. Feeling like I do now, it wouldn’t be worth the risk. Feeling the way I felt a year ago, my answer would be yes. So, you measure the pain against the risk. Since we need to do that and since the risks are big and since those risks are ours, this data should be clear and easy to understand. Enough thinking out loud for me. Ok – guess I’m not entirely done thinking out loud – I work in finance and analyizing numbers is what I do so looking at this data, i think it might still be important to note that at a 10mg dose 65.7% have at least an ACR 20 response as opposed to no response ( this is where the information from the overlaping data is valuable ). However, what becomes more clear when you look at the data as stratified in the second table is that increasing the dose from 5mg to 10mg can convert 31 nonresponders to responders and even more interesting is that 15 of those (48%!) will be ACR 70! Obviously, well worth an attempt at increasing the dose if at first you don’t respond assuming that the increased risk of adverse side effects is not prohibative. May we all have the opportunity to study the data or someone who will help us to understand our choices! Clinical trials in rheumatoid arthritis: a status report from the ClinicalTrials.gov website. Department of Medicine, St. Luke’s Hospital, St. Louis, MO, USA. The aims of this study are to describe the characteristics of clinical trials in rheumatoid arthritis (RA) listed in ClinicalTrials.gov and examine existing trends in study design, funding sources, outcomes, and drugs under investigation. 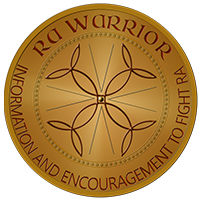 We conducted a survey of ongoing clinical trials in RA registered in the ClinicalTrials.gov website. We used the advanced search option and applied the following inclusion criteria, “rheumatoid arthritis”, “open studies”, “interventional”, and “adults 18 years or older”. Of 127 eligible trials, 53.5% of the studies were either phase 3 or 4, and 40.2% were phase 1, 2, and 2/3. Two-thirds of the trials were randomized (70.9%), and over half were, in addition, double-blinded (53.5%) and placebo-controlled (53.5%). Universities were listed as the primary sponsor for 18.9% of the trials and pharmaceutical industry for 73.2%. Majority of the trials were multi-center studies (93%) conducted outside the United States (54.3%). The most frequently used endpoint was drug efficacy (54.3%) followed by drug safety (25.2%). Most industry-funded trials were open for less than 12 months, whereas most university-funded trials were open for more than 24 months (58% each). Biologic therapies were the focus of most trials in the registry (78.5%). Randomized, double-blinded, placebo-controlled, phase 3 and 4 trials form the majority of ongoing clinical trials in RA. The preponderance of industry funding of RA trials and the short duration of such trials are troubling trends which need to be addressed. Maybe you could help me out with what this might mean? I would be concerned about how short the duration of the trials are since the drugs are meant to be taken long term and of course I would like to see more interest in side effects as well – safety as well as efficacy, but much of what is discussed here I just don’t know enough about to know what it even means. As far as industry funding the trials, that doesn’t surprise me at all, there is money to be made here, though it is concerning since where there is money to be made there is always the risk that someone will do something untoward to get it. As I said, maybe you can help to enlighten me here. Hi Chelsea, I started with Humira and had a ACR 90% response that lasted for 7 months. When I dropped to ACR 60% we increased the dosage to weekly. I had improvement but then went backwards again. In July of this year I started Enbrel. I am now, again, at a 80-90% response and am happy to have it. I am very aware that it may not last, but before I took these bios I had to use a cane, then a walker, and then found myself in a wheel chair. The only thing that kept me on my feet was 20mg daily of prednisone, and heavy use of pain pills and I still had severe pain. 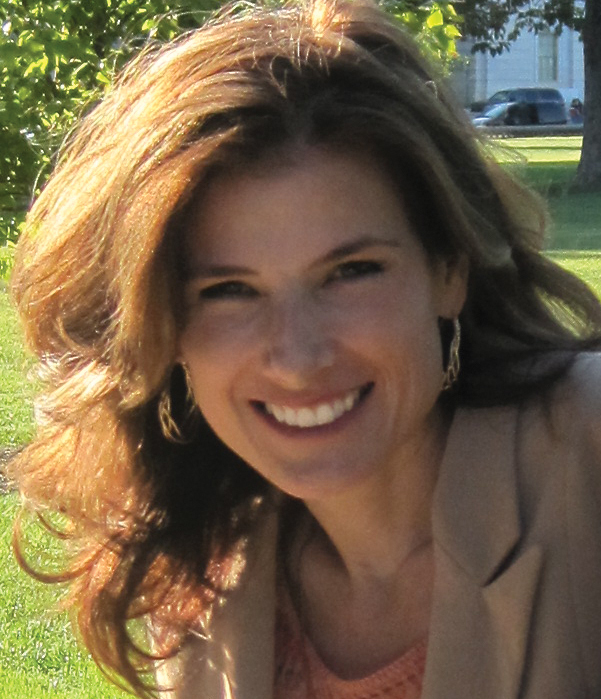 During my darkest days before I started biologics I did not want to go on with my life. They were literally my last hope. I know there are many of us that have a severe disease course like this. I cannot imagine where I would be if my rheumatologist had not let me try biologics because I might not respond or only respond for a short time. I do believe the response rates should be separated, but I think there should also be a line showing total responders vs total non responders. Hope is a good thing, and I worry that taking away the percentage of total responders ACR20 and up may shrink our treatment options as doctors and insurance companies may not see the point in even trying. I think a balance of both charts are needed, totals and a breakdown. The overlapping method of reporting response is deceptive to anyone not aware of its use. This is the first time I realized that was how they reported ACR. The non-overlapping ACR paints a much less optimistic picture. Though either picture is no where near as glorious as the TV ads make it out to be. Don’t get me wrong, I’m not knocking biologics, and certainly can understand wanting to feel that ACR 90, even if it is for only a short time. But not being that limited and not in severe pain, I do tend to remain on the conservative side of biologic use for myself at this point in time. I know I may be shorting myself as I do have slowly progressive joint damage that a biologic might slow down more. Especially given some new studies out on joint damage progression under methotrexate. For me the potential risks and the huge cost don’t outweigh what I cynically see as a more limited benefit, assuming I’d fall into the lower group of responders or non-responders. (And Kelly, I’m hoping they are halting joint progression for you, even if they aren’t touching the pain.) If I get to that point I’ll probably be on the other side of the fence though. I haven’t decided if my doc’s conservative view is a negative or not. I guess it would be if I wanted a biologic and she said no or kept putting it off. I guess I’m saying I see/hear of more negative experiences in terms of lack of, or waning of efficacy, or side effects, from less severely disabled RA’ers and it doesn’t justify the costs and risks to me in that case. And it appears that may be what my new doc’s experiences have been for many of her patients who are or were on biologicals. For more severe cases I do believe it does. It’s all relative I guess. In your post today, you linked to a post from last fall on ways to report RA response. Very interesting. The non-overlapping method seems much easier to understand, especially with percentage of non-responders specified. As I keep moving up to more and more potentially toxic choices (next for me will be either Actemra or Rituxan), it is extremely important to weigh the benefits and risks. I think Leslie mentioned this earlier. With the scarier drugs, 20% improvement (ACR 20) doesn’t seem like enough; I can vary 20% day to day, week to week, without change in meds. 70% – which I had on Enbrel for a number of years – that really counts! Any changes that can help us all with our ongoing difficult decision-making is useful.